Catering Service, Restaurant: Muscatine, IA: A Guy and a Grill, Inc.
Ribeye steak sandwiches, salmon patties, bratwurst, potato salad and seasoned wedges-you'll find that and more at A Guy and a Grill, Inc. We serve a variety of Midwestern-style dishes at our grill and barbecue restaurant in Muscatine & Davenport. If you have an event coming up, you can request our mobile grilling service so you can provide your guests with delicious food. Whether you visit us or we come to you, we'll make sure everyone leaves full and satisfied. Call 563-260-0229 now to place your custom event catering order. Good food. You'll enjoy our selection of smoked and grilled comfort food. Exceptional service. We employ friendly staff who will cater to your needs. On-site grilling. Who doesn't enjoy watching a master griller at work? We can visit your property and grill your food at your event. You'll be hard-pressed to find a restaurant like ours in the Muscatine, IA and surrounding areas. Contact us today to learn more about us. Iowa residents have been visiting A Guy and a Grill for 13 years and counting. Our patrons keep coming back for our delicious entrees and savory sides. We've received glowing reviews in person and online. Come see for yourself what the buzz is about.  Visit A Guy and a Grill today to sink your teeth into a warm barbecue meal fresh from our grill in Muscatine, IA or give us a call for your next catering event. We service Muscatine, Davenport, Moline & surrounding areas.